locomotion when hitting a wall. Credit: Sándor et al. 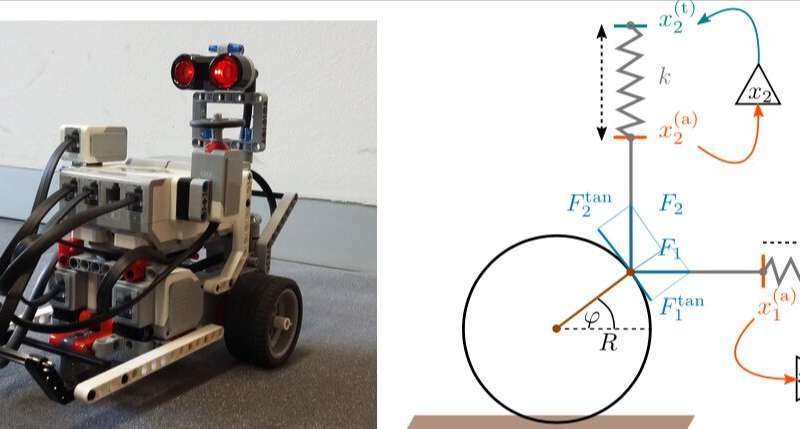 A team of researchers at Babes-Bolyai University, in Romania, and Goethe University Frankfurt have recently collaborated on a study exploring implementations of kick control on both simulated and real-world wheeled robots. The term 'kick control' refers to short, higher-order commands that can be used to 'kick' a system from one self-organized attractor into the basin of attraction of another attractor. "When we move, do our muscles just react to the signals the brain sends, or do they take into account also the state of the joints, of the tendons and of the muscles themselves?" asked Claudius Gros, one of the researchers who carried out the study. "One speaks of 'embodied locomotion,' if the latter is the case. Our research is dedicated to investigate how embodiment helps animals and robots to navigate the world." In nature, even animals with simple nervous systems can navigate a variety of complex environments. In order to move around both known and unknown environments, robots should have similar sensorimotor skills. So far, however, scientists and engineers worldwide have been struggling to design robots with motor capabilities that resemble those of humans and animals. "Coordinating a high number of actuators in a continuously changing environment is certainly a challenging task," Bulcsú Sándor, another researcher involved in the study, told TechXplore. "So why don't we let the body of the robot do the hard work, by taking over a substantial part of the computation? Following this idea, we suggest an alternative control scheme in which motion patterns are generated in a self-organized manner. In this framework, locomotion is created via a dynamical interaction between the brain and the body of the robot, and the environment." function of the parameters of the controller. 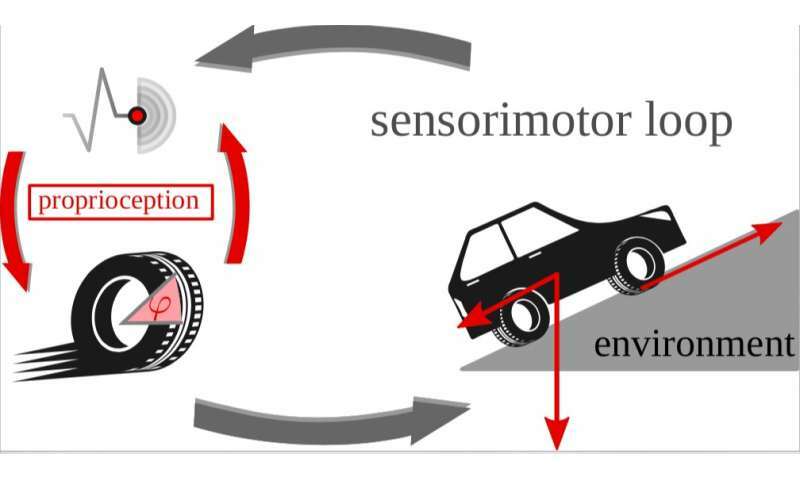 Sándor, Gros and their colleagues devised a controller framework in which movements are not rigidly defined, but rather are described by a set of equations for controlling actuators that are dynamically changing, incorporating the body's proprio-sensory information. They then tested and refined these equations in the LPZRobots simulation environment. "Due to the interaction of the robot with its environment, several self-organized motion patterns can be created," Sándor said. "This allows us to switch between these behavioral primitives by a well-defined kick-like control signal. This is what we call `kick control`. Finally, as a proof of concept, we implemented this idea on real-world wheeled robots." Coordinating the contraction of the many muscles in the body is a very challenging task, which is innately acquired by most humans and animals. In their study, Sándor, Gros and their colleagues tried to devise an easier method to instil motor skills to robots. the environment. Credit: Sándor et al. Simulated robots (one car, 5 cars connected into a train). Credit: Sándor et al. Lego robot and the controller mechanism we used. Credit: Sándor et al. Depicting how the robot changes autonomously the directions of locomotion when hitting a wall. Credit: Sándor et al. "Wouldn't it be much simpler if the brain would just give a short kick signal and the body of either an animal or robot would carry out a well-coordinated movement by itself?" Gros said. "This is the key idea behind kick control. It can be realized, as we discovered, when the robot disposes of self-organized actuators." 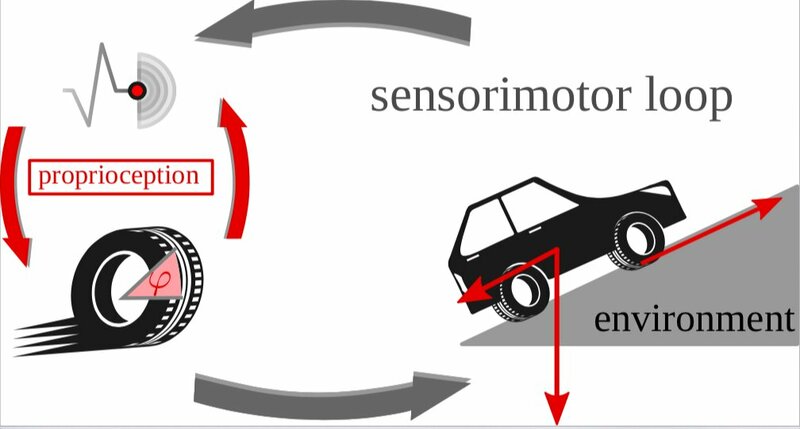 The researchers evaluated their framework on both simulated and real-world wheeled robots, generating the dynamics of distinct wheels independently via local feedback loops. These feedback loops are mediated by rate-encoding neurons, which process propriosensory inputs describing the actual rotational angle of each wheel. Subsequently, a simulated transmission rod that resembles those used in steam locomotives translates changes in neural activity into a rotational motion. "We demonstrate how self-organized motion patterns can be used to generate embodied locomotion," Sándor said. "Using this control scheme may help to simplify complex computations that need to be carried out to complete various locomotion tasks. Combining it with other methods may lead to powerful tools for generating complex robotic behaviors. Our framework could also contribute to the understanding of animal and human locomotion." 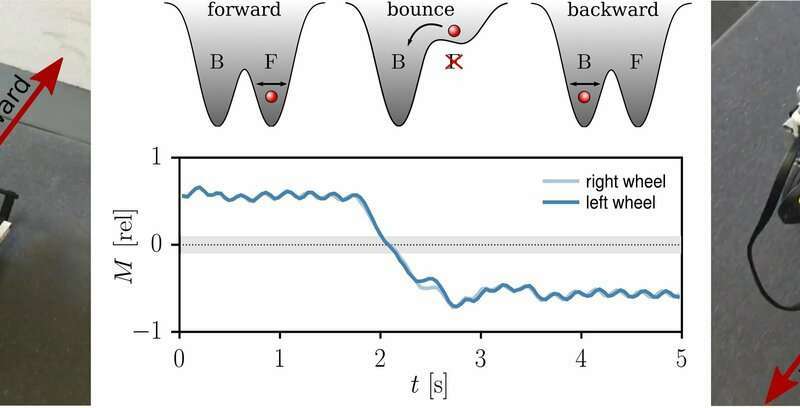 The study carried out by Sándor, Gros and their colleagues could lead to a new technique for efficiently controlling the movements of robots. The key practical advantage of their framework is that it allocates part of the computational load to the robot's body. 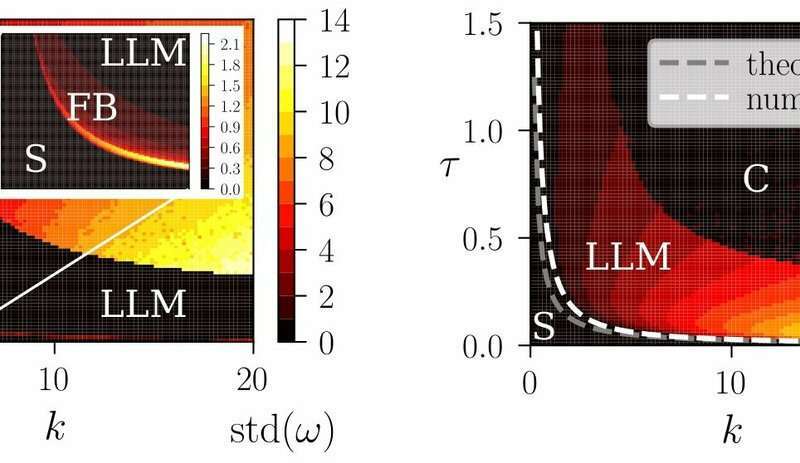 Their model could also be used to teach dynamical systems in high school physics courses, as it allows for interactive and engaging demonstrations. The researchers are now planning to test their algorithms on more complex robotics architectures, incorporating different sensory modalities into their equations. For instance, they could apply kick control to a hierarchical organization of controllers, in which visual information triggers a particular locomotion mode. "We are currently working on generalizing our principles to legged robots, in particular hexapods, and our first results are promising," Gros said. "We are also investigating the activation of kick control by sensory information."